At Heritage Pointe of Warren, we are fighting back against Parkinson’s Disease! 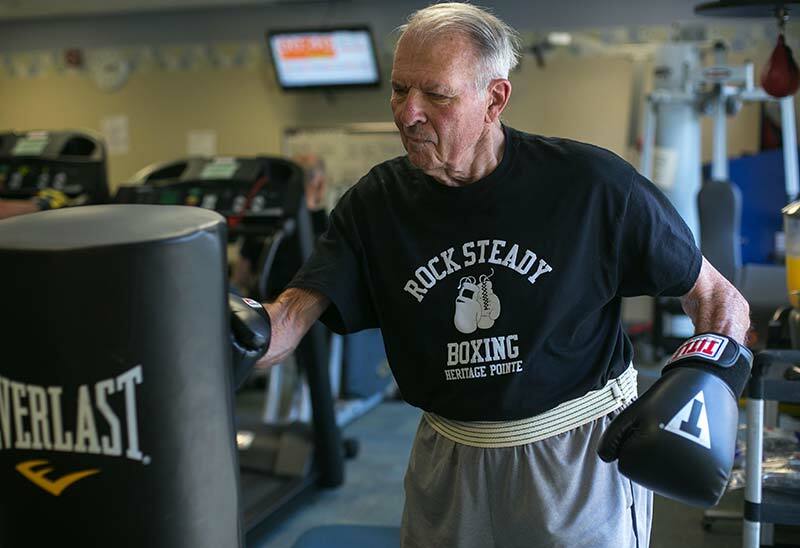 Rock Steady Boxing offers hope to those with Parkinson’s Disease to build strength, flexibility and speed. Rock Steady classes have proven that anyone, at any level of Parkinson’s, can increase quality of life. Heritage Pointe of Warren began its Rock Steady Boxing program in February of 2015. The number of participants has doubled in size since then. Our participants are not only internal residents but also come from surrounding counties. If you are suffering from Parkinson’s Disease, ask your doctor if Rock Steady Boxing is right for you! By clicking the “learn more” button below, you will be able to read more specifics on what Heritage Pointe of Warren has to offer. Call (260) 375-2201 ext. 4290 or 4269 (Stacia Perry) if you’d like to sign up or get more information. Non-contact, boxing-inspired classes can reverse, reduce and delay symptoms of Parkinson’s Disease. In addition to being an intense, diverse form of training, boxing is also an incredible stress reliever, confidence booster and FUN! Heritage Pointe of Warren offers Rock Steady Boxing as a cutting-edge opportunity for our residents. Please call, email or click here to learn more about Rock Steady Boxing at Heritage Pointe of Warren.